Sound is a powerful thing. It can inspire, enhance and set the mood. The music we choose to listen to is highly personal to our tastes, as is the medium through which we hear them. If you’re looking to enhance the sound quality of your music, speakers are an excellent option. There are two broad sub-categories with music speakers – portable, or multi-room wireless models. The former is great for those who need something smaller, without wires and like to listen to music when outside the home. The latter generally offers more punch and higher quality, and can create a sound system throughout the house. However, one size does not fit all. A bit of a boost for your music streaming is one thing – a complete surround-sound system quite another. It is therefore very important to do your research beforehand, especially if you’re going to be spending a lot of money. Whatever you want it for, there will be a perfect speaker out there for you. These are the best speakers we have reviewed. Simple, versatile and an alright price – quality doesn’t have to break the bank. Yamaha may not be the first name you think of when choosing your new speaker, but the C10 makes it a name to remember. Whether you’re going to be listening to audiobooks or thumping house music, it will be able to give you almost perfect results. You can connect it to other MusicCast devices, which allows the sound to follow you through the home or really get the party started. Because it can play music wirelessly, it is ideal if you want a bit of free reign when it comes to positioning, or if you like to keep your phone on you when using it to play music. Something which will appeal to people who are fully on-board with voice control is the ability to connect it to your compatible Alexa device, which will let you switch songs just with your voice. Which comes in very handy when you’re in the middle of cooking and baking. Thanks to the Wi-Fi connectivity, you can stream straight from Spotify, Tidal, and Napster, so you have access to music literally at your fingertips. The sound is good for a single unit, so there is no need to continually boost it by adding further speakers either. We will say that there is a noticeable difference when part of a stereo pair, though. We say good, because it isn’t absolutely perfect. Clarity is strong, but it struggles a little with the higher tones despite being decent at the lower end of the scale. However, this could well be a good thing for some people out there, as it makes it all a little more natural as opposed to sounding too forced and strained. Still, when considering price and the fact it is one of the easiest to move around, we would say it still measures up nicely. We love subtlety, but we also love those appliances which stick out and really make an impact. This is where the A9 comes in – you won’t be able to miss it. As it is a floor-standing speaker, it is pretty adaptable around your home. You don’t have to scrabble for desk space or run extension leads. Just pop it in the perfect position, and you’re good to go. Because of the size, it is probably best aesthetically for those rooms which are quite minimalistic and modern yet filled with large, imposing statements. But even if you want to keep the floor clear, this could still be the speaker for you. The handle on the back also doubles up as a wall bracket attachment so that you can place it there without the stand. Just purchase the dedicated bracket separately. All this, and we haven’t even mentioned the colour choices. There is the usual black and white, but you also get a bronze option in case this better suits your decor. In terms of sound, it can adapt to its positioning naturally, so you don’t have to reconsider your choice or manually alter the settings. It delivers an experience nothing short of excellent, with jaw-dropping sound and clarity. There is a fragility about it all, so it isn’t one for a home which is pretty hectic and often ends the life of your electricals too early. But those bothered about style will struggle to find something quite as eye-catching – if they have no limit on the price. Able to work alone or as part of a system, this Sony speaker comes complete with SongPal Link which lets you stream via Bluetooth or Wi-Fi in superior quality. There is a whole host of connection options, so no matter your favourite or the most appropriate, it should slot seamlessly into your lifestyle. There is NFC to make the connection easier, and if you’d rather keep things stable, a 3.5mm jack option gives you wired results. This is a lot more than many rivals offer. SongPal also makes setting up and controlling an entire system easier. Group Mode allows you to play your music across every speaker in the home, or you can use Single Mode to play different songs over multiple speakers. Why not connect it up to some other smaller Sony speakers for a surround sound experience, or your television soundbar? There is an HDMI input for wired, reliable communication. To get the music on the speaker, just cast it from your device directly through the app. Streaming through Spotify Connect and Google Cast means that pretty much every source is compatible. It also means that you can access the music through your phone, tablet or computer. It works with Google Home for voice control, too. Say an artist, song or playlist, and it will start playing immediately. The SRS-ZR5 is a lot cheaper than the Sonos and Bose alternatives, which will appeal to anyone who needs to stick to a budget. The bass could be punchier, but the overall aim is that it is small and clear, so we let this pass. ClearAudio+ technology certainly makes a difference. One of the latest Sonos speakers to hit the market, and one of the highest-priced too. But this is a signal of just how good it is – it is very worthy. Setting it up is nice and simple, with the app talking you through pretty much every step. It just needs connecting to your home Wi-Fi. Should you be adding it to an existing multi-room setup, you probably have a Sonos CONTROL unit already, in which case it can detect your new toy and immediately prompt you on how to set it up. If you don’t have a system but think this is something you’d like in the future, then you can connect up another 31 speakers to fill your home with music. Think we can all agree this is more than enough. Concerning sound, there are six custom-designed drivers – three tweeters and three long-throw midrange drivers, each with a dedicated amplifier, to be precise. Trueplay audio technology optimises the sound for the speaker’s environment, so you can rest easy knowing you always get the best quality no matter where it is placed. There is no Bluetooth, so you have to play everything through the Sonos app. This means you could be slightly restricted in terms of which platform you can play your music from. There is always the wired connection though. Integrated Bluetooth could have improved flexibility, but the Sonos app isn’t hard to navigate. On a more positive note, the design is sleek which helps when you want the sound without the imposing appliance. It is Alexa compatible if you love the idea of controlling everything with your voice, and there is a real level of clarity and bass which makes the listening experience very enjoyable. The latter is thumpy without being imposing. It is a little expensive, but well built and should stand the test of time if you like to splash the cash now and reap the benefits later. A good lower priced speaker if you want the multi-room setup on a budget but still need the sound to be worth your buck. It connects up to an internet connection, so not only can you create your wireless network, but you also have access to over 20,000 internet radio stations and online music services such as Deezer and Spotify. Don’t panic if you have your perfect playlist downloaded on your phone though, as Bluetooth will let you play directly. Everything can be controlled through the dedicated SoundTouch app, and for anyone who likes to step away from the phone every so often, a remote also allows you to change stations and skip songs. You can save up to 6 radio stations or playlists in the dedicated pre-set slots, so they are much easier to access when you don’t want to bother messing about. If you do have a multi-room network, you can also set particular groups to play music through – say you want T-Rex on the upstairs bedroom and bathroom speakers while you clean but the rest of the family are listening to Beyonce in the conservatory, you don’t have to struggle. Sound is good both on low and high volumes, and thanks to the modern yet basic design, it should happily slot into any room. There is no display to let you know what is currently playing, and there was the occasional loss of connection, but this is not necessarily a rare issue when it comes to internet-based equipment. They were minor frustrations which are easy to live with as seeing everything else is solid. You want something which will really make an impact both in terms of sound and in design and size. Something which will fill your sideboard and tell all of your visitors that you love your music without them having to ask. This speaker is named Zeppelin for a reason – when looking at it in place, it gives hints of the iconic shaping of the infamous airship. Packed in this body is loads of technology to give you the best possible sound. There is a set of drive units, which have taken inspiration from Bowers & Wilkins award-winning range of Hi-Fi systems. This gives you the volume which can fill your room. Then there is the Double Dome tweeters and long-throw subwoofer. Both of these work together to give you the high pitches and deep thumping bass which provide the icing on the cake to your music experience. Thanks to the elongation, drive units are both at opposite ends of the appliance. This means that the sound is dispersed evenly for a more floor-filling result through the room. Connectivity input is delivered through a 3.5mm auxiliary input. Or, you can choose to go wireless if you have AirPlay or Bluetooth. If you’re a Spotify user, then the built-in Connect service will let you start playing straight away and cut out the middle man. Overall sound is very tight and clear, and it comes remarkably close to rivalling a complete system. We reviewed the older versions when they were released, and a huge improvement in sound, connectivity and overall usability is very notable. Packing in some powerful sound for a speaker which is so small and unassuming, this is an item which fully shows off Marshall’s technology and expertise in the audio world. The sound is clear, too, so you can experience Fleetwood Mac in all their glory again, just as you used to on LPs. As there is Bluetooth, you can connect any compatible device. This will make it easier than ever to get your music streamed into your living room. 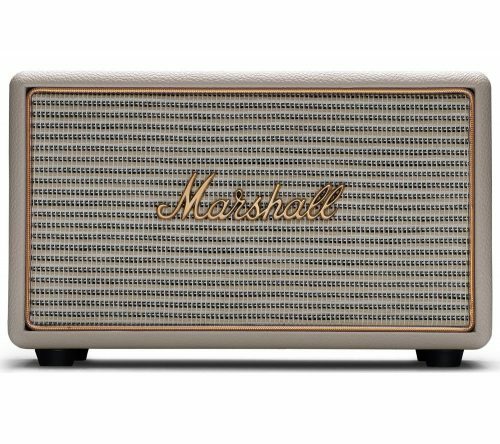 This also means that you can connect up other Marshall speakers for a full multi-room environment. Using the dedicated Multi-Room app (available for iOS or Android devices), you can play your favourite music on separate speakers. Or, play the same song on up to five speakers simultaneously. Perfect for a whole home filled with sound. It can also connect to your WiFi, so you can stream directly from services such as Spotify or Deezer without needing the dedicated app on your phone. Because of all this wireless-ness, you are free to place the speaker wherever you wish without any restrictions. We like the cream colour as it is something a bit different and brighter than the usual blacks. It certainly gives a more retro feel. If you’re looking to start your multi-room collection, you may be a little put off by the price. But you are getting a very solid speaker with years of expertise packed in. There are a few things which appeal to some prospective speaker users/buyers more than others. If two things on your list are a host of connectivity inputs and quirky design, then this NAIM model should hit the nail on the head. The design is the first thing to discuss. It is described as having ‘contoured, glass-filled polymer case and room-filling bass radiators’. The controls on the top are also pretty great, being smooth and sleek touch controls which blend in seamlessly with the overall look. Thanks to the flexibility in connectivity choice, you can pick the one which is best for your preferences and technology setup. Say your phone has Bluetooth or AirPlay – connect wirelessly for ease. Do you want to connect your MP3 player for a change? The audio jack input should easily be perfect. There is also an optical connection in case you want to hook up a turntable or use it as an additional television speaker. Because there is built-in WiFi, you can directly access streaming sites such as TIDAL or Apple Music. This also gives you access to thousands of radio stations, in case you like some background music while doing the housework which won’t let you get too immersed. You can also store and access music through UPnP (Universal Plug n Play), from a USB stick or similar connected device. It can be synchronised with up to five other speakers from the same brand if you want a multi-room experience. For those on the more technical side of the scale, a 32-bit digital signal processor controls how music flows to each speaker, and two EQ presets let you change the sound depending on whether it is positioned near a wall or in the open. This super-compact and versatile multi-room speaker is a great choice for those who love listening to music throughout their home. Small enough to place almost anywhere – on a shelf, desk or worktop – it is very easy to set up and operate using the Sonos app on your phone. You can also add more devices over time with no fuss. Choose whether you want music to play in sync across the house, or rather something different in each room. Fully compatible with music streaming services and online radio stations including Spotify and iTunes, with this speaker you get complete control over your music with the touch of a button. This speaker is wireless, which means you can play music via your Wi-Fi connection or plug straight into an Ethernet cable if you prefer. It’s possible to build out the sound of your Sonos-system over time by adding a playbar, sub or both. We love the simple aesthetic of this small but powerful speaker and how easy it is to use. Bose have been providing the ultimate listening experience for decades and they have now began to dominate the wireless speaker market. There’s currently an emergence of wireless speakers that connect to Bluetooth and this is great because many of these gadgets can be played together. You might be wondering what we mean, essentially this powerful and dynamic speaker can be the hub of your music or it can just be one of many. Add to your SoundTouch system and sync them together, you can connect all of them to one device and play through multiple rooms at once. This Bluetooth Bose speaker possesses numerous technologies that allows all listeners to easily access over 20,000 radio stations and thousands of your favourite music via the likes of Spotify, Deezer and other platforms. There’s no need for complicated add-ons or any serious installation, it’s all setup and ready to go. If you want to move it, then why not pick it up and take it with you. We love this new age of speakers and it wouldn’t be right if this brand didn’t feature heavily in this niche, it’s now easy to spend as much or as little as possible. Don’t underestimate it due to its size and subtle sleek design, because the sound quality is immense and can be controlled from your smartphone or tablet. Competing with the likes of Sonos it’s now a hotly contested rivalry and one that we as consumers can enjoy. 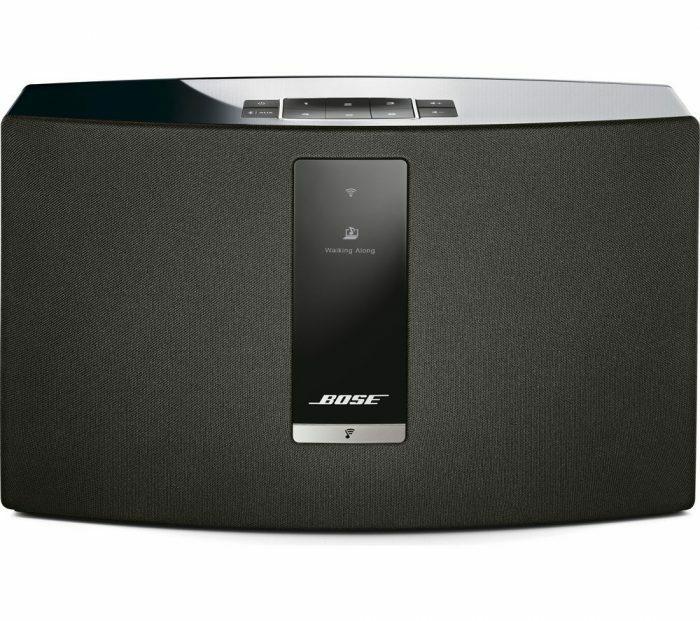 Bose have upped their game and if you’d like to stream music throughout your home then check this item out and why not add to it? A good all rounder. Although expensive, the quality is worth it. Something completely different now, for anyone who likes to take music on-the-go but is growing tired of headphones. This is a wearable speaker from Bose, which rests on your shoulders and moves with you, without having to bother about wires and carrying anything by hand. The bass is cancelled out for anyone nearby so that you won’t disturb people. Sound is still perfectly directed towards you though, with waveguides pushing air to the right places. You can even use it for phone calls, and you’ll hear everything clearly. Disturbances such as wind do not affect your experience at all. You probably think it is going to be the most uncomfortable possible way to listen to music ever, but in actual fact, it form-fits your shoulders so you will hardly realise you are wearing it. The weight is also at the lower end of the scale, so it isn’t going to cause pain after prolonged use. Safety is a tick in the box as well, because you can leave your ears free to pay attention to what is going on around you. If you cycle to work, this is perfect as you can hear traffic or other dangers. The 12 hours battery life is generous, and a quick 15-minute boost can give you an extra 2.5 hours which should be enough for the commute in the morning. It connects to your music source via Bluetooth so you don’t need an internet connection, either. If you want something which hovers around the £20 mark, is very portable and has a good connection range, then this is a brilliant option. It is a tiny speaker, yet packed with all the tech which is required in a speaker to make the listening experience top notch. A 5W driver and passive subwoofer give you rich sound at all levels, and there is even a noise cancelling microphone so you can make hands-free phone calls through it. Because it is so small, it will be able to fit in any bags or backpacks. The size isn’t the only design appeal either, as it is also available in four different colours – back, gold, grey or rose gold. Ideal if you want to match it up to the colour of your other devices, such as your iPhone. Connections can be made via Bluetooth, or you can use a wired aux cable for any other devices which aren’t compatible. There is also a microSD card support if this is your preferred method of music playing. This can be up to 32gb, but the songs must be in MP3 format. Sound is great for a speaker of the size, with no distortion or struggle. Obviously, it isn’t as powerful as some others on the market and you aren’t going to hear every little detail or bass which can start a party. But for anyone who just wants good sound without needing to nitpick every detail, it is an affordable portable option. The combination of brilliant speaker design with the touches needed to make it fully portable. The name ‘Lightsounds’ is inspired by the gentle illumination from the speaker when it is working, which adds to the atmosphere. If you are in a tent or caravan, this extra little night light really boosts the whole camping experience. Adjust the light from a vivid glow, right down to a calming ambient level, depending on the needs. Whether it is dark outside and you need to be able to see what you’re doing, or you are just enjoying the evening and watching the stars, the ability to choose the level comes in handy. This isn’t where the experience stops, though. You can choose to either power it with the rechargeable battery option or by mains. If your mobile phone is running out of juice, it can also top this up, effectively being used as a power bank. All you need to do is connect via a USB cable as normal. Thanks to the water-resistant design, even if you are spending a day by the sea or know the dog will shake itself dry after a dip in the river, it should stay safe and sounding top-notch. Connections can be made with Bluetooth or a wired 3.5mm aux, so even if you don’t want to take your phone away with you and instead like to use an MP3 player, you’re safe. It can also be used as a hands-free device to answer phone calls. The battery will last for up to 36 hours of music, but you can also just use it without sound as a light and it will last for 48 hours. This is good if you like to keep a light on as you sleep. It doesn’t take long to recharge when comparing with other models of its size which is good if it just needs a quick boost before you are on the move again. It is all well and good having a portable speaker which can be taken into the garden for your summer barbecues and parties, but sometimes you need something a lot sturdier. This is perfect for the more adventurous needs, thanks to being robust and lightweight. It is no bother to carry around, and you won’t have to wrap it up in cotton wool when transporting. Despite the small size and overall aim, it still delivers exquisite sound. It has been designed to disperse this omnidirectionally, to ensure that wherever you are sat, you will receive the same level and quality of sound – ideal for campfire nights. The bass is punchy too, which is not something often said when reviewing speakers of this size. There is Bluetooth, so you can wirelessly connect your streaming devices – perfect if you’re one to forget your chargers/headphones. Just hang it from an appropriate hook using the leather carry strap, or set it flat. Talking of charging, it can hold power for up to 24 hours on a full charge, which should give you plenty of listening opportunities. Because of the sturdiness, we think the actual speaker could well last for years too. Colour probably isn’t top of your list of requirements with a product of this type, but you can choose from a range including moss green, white, black and sand stone for extra personalisation. The overall design is simplistic but modern, and definitely a winner. There is nothing to stop you using this speaker when not on-the-go too, as we think it does rival the sound provided by some of the multi-room wireless speakers which would normally take up a lot of space on your sideboard. Perhaps you want one you can move around or a non-imposing solution for the bedroom. Either way, you will be pleasantly surprised. Our only niggle – and it is a common one – is that the buttons are designed to be invisible, but this makes it near on impossible to actually see them, especially in bright lighting such as on a sunny day. It powers off after 15 minutes of inactivity, so you do have to get used to finding the power button. Up to ten hours battery life, small and light enough to pack in your bag and the ability to connect to any compatible smartphone, tablet or media player – this is an ideal item for anyone who loves music on the go and needs something that can handle it. USB charging makes it easy to top the battery up, and on a full charge, it can last around ten to twelve hours without losing any sound quality. It also comes with a charging cradle, so if you’re not on the go, you can keep it in place and charging at the same time. Bluetooth connectivity is available, and it will remember the last six connected devices for easy setup next time you use it. The speakers will also work as a speakerphone if you get a call when you’re otherwise busy. Sound quality is incredibly high for an item of its size. The dual-opposing passive radiators work together for deep bass, giving a great performance no matter where you are. It can be controlled by your smartphone if you need to adjust volume, and an auxiliary port will also allow you to connect other devices such as iPods or MP3 players. Available in black and white, you can also take care of the aesthetics as well as the sound. Why not match it to your other gadgets? You may look at this portable Sony speaker and think that there is absolutely no chance it can handle the music for your party. It is small, compact, and you could be mistaken for thinking it is all looks, no substance. However, it packs a surprising punch. Bass is a big focus, so when you’re playing the latest EDM tracks to get you ready for a night out or during a house party, you’ll be able to hear every detail. This is because the speaker cones are reinforced, so even if you have a bit of a mixed playlist, every genre will sound just as it should. Live Sound mode helps you out if the party is outdoors, as it spreads the sound through the area and recreates the concert feeling. Also, whether you’re lucky enough to have a full-size built-in pool or hot tub, or you’re all in the paddling pool, the speaker is both water and rust resistant. Any accidents are therefore recoverable. The lights around the edge of the speaker are a lively addition, and they pulse in time with the beat to add a bit of atmosphere. If you want a speaker which you can take to friends houses, then it may not be the best choice as it is quite heavy. But for moving it around the house, the sound is well worth it. For a portable wireless speaker, it doesn't half measure up to the quality of some of the high-end larger speakers. No wonder it is so popular. As an industry leader, it’s only right that we delve into this new lightweight speaker. The portable product is so easy to transport, meaning that we can take flawless sound wherever we go. The immersive speaker is the centre of the party and essential for your home, as you have the option to utilise it for music and movies. It can easily be connected to your phone, tablet or television so you have the full experience. The seamless design isn’t just about looks but also practicality. The 360-degree coverage ensures everybody gets to embrace true sound quality. It offers over 12 hours of playback on a single charge and is also water resistant. It can be used on the beach, for your travels, at a party or simply embed as your household media staple. There is the option to purchase with a dedicated charging hub if you want a permanent setup. Why not connect to the rest of your Bose collection and sync them up for stereo sound? On first look it seems expensive, but we were soon proven wrong! This is the ultimate speaker, it hooks up to your complete system and it can also be used for many other purposes with it only weighing 0.66kg. An all-round speaker that can easily fit into your home or be taken on your travels! From the moment you lay eyes on this stylish speaker, you can see that it’s been made to last. The durable gadget is lightweight and is also water resistant ensuring that you can enjoy music from wherever you wish. It’s no secret that the market is becoming very competitive and there are lots of very capable speakers within the portable category, and JBL have now joined the race. The good thing with a company lesser known such as JBL is that they are simply charging for the fact that their product excels. You can stream your smartphone sound straight to your speaker, meaning that you can party with this ultra-light product and also connect anywhere in your home. It also comes with the option of connecting more than one speaker- giving you the opportunity to create an entire sound system. Not only does the Bluetooth speaker unravel crisp, quality sound that adjusts to the genre but it also has a battery life capable of 20 hours of music playback. This is a great wireless portable speaker which comes at a great price. Good quality audio played through a smart phone. There is no denying that the Sonos system is a brilliant platform. You can connect up all of your music streaming services and control them all from one app. But if you already have some speakers and don’t want to fork out on several Sonos speakers, purchasing a single Connect: AMP may be the answer. It brings the power of an amp to all of the connected sources, turning any speakers into a Sonos Hi-Fi system so that you can hear every detail. You can control it from Android and Apple devices, and listen to music from various sources such as Spotify and TuneIn Radio. Most control has to be done through the dedicated app, but if you bought an Apple Airport Express before they were discontinued, you can hook this up via the in-line and play through AirPlay. There is subwoofer output with automatic crossover, which ensures that low frequencies are sent to the subwoofer and high frequencies to the speaker. Perfect if you have a 5.1 system and don’t want to risk any distortion. You also have control over the bass and treble so that you can fine-tune the audio for your needs. The cost makes it by far the most expensive way to create a system out of your current speakers, but we can’t say we are surprised by the price tag from a brand such as Sonos. If we are to justify it, we will say it is a single solution to the multi-room connection issue as opposed to having to purchase a single device for every single speaker. Depending on how many you own, this could work out for the better. It also compacts every control into one app and gives you the ultimate sound quality. Just as a television Chromecast allows your TV to pick up visuals from another device, this Chromecast Audio can allow your speakers to pick up audio. All you need to do is connect it to the Wi-Fi and use your iPhone, iPad, Android phone/tablet, Mac, Windows laptop or Chromebook to source the music. It is designed to bring those older speakers which maybe came without Bluetooth and AirPlay to be brought right into the 21st Century, and also foregoes the need to wire the device directly. The perfect way to achieve tether-free music. You just need to tap the Cast button on your device, and it will be picked up. From here, you can adjust the volume and switch songs. Streaming is possible from Spotify and Apple Music, as well as many other popular platforms. It is worth noting that, just as with Amazon Echo and other smart speakers, you can only stream from the paid versions. It is discrete, which is good for anyone who takes the look of their audio setup seriously. The cast can also be linked with other Chromecasts if you want the multi-room setup without buying new wireless speakers. The mini 3.5mm jack lead supplied is quite short. Depending on where you want to position the cast, you may need to purchase another. There are also a few sources it won’t support as of yet, such as YouTube, Amazon Music or BBC Radio/Sounds. But, on a whole, the sound is incredibly good, so we are sure you won’t miss them. Overall, it is a cheap way to turn your stereo into a modern technology-filled device. And it will be much more cost-effective if you want to create an audio system. The more powerful your device is, the higher volume it can reach without loss of quality. Most have a power rating, but it can be tricky to ascertain what kind will work best in a particular room based purely on this metric. As a ballpark guide for those who want a really decent speaker, aim for 25W and above and consider using an amplifier to improve the quality of the sound. By contrast, frequency refers to sound range. Quality speakers will produce sound in the range of 20-20,000 Hz – the same range as the human ear. An option with wireless, AirPlay or Bluetooth connectivity can be a great option for those who enjoy listening to music and using music streaming services. Wireless speakers can be connected to your devices – laptop, smartphone, tablet – and play seamless music at a much higher quality than you will be able to achieve with built-in device speakers. Being wireless, your device doesn’t have to be physically tethered to the speaker, so you’re free to carry it around as usual. If you have your eyes set on a model which doesn’t have this function, you can always buy one of the above casting devices to make things easier. Where you decide to place your speaker can impact the sound quality that you get. Variables such as room size and hard/soft furnishings will affect the acoustics, so this should be something that you think about before making your purchase. If you have a small room, go for smaller models with minimal bass. If the room is large, consider bigger speakers and perhaps a sound-bar to maximise surround sound. Bear in mind that soft furnishings will absorb sound, whereas hard furnishings disperse it and bounce it around. A room with lots of soft furnishings therefore needs more powerful speakers than one with a lot of hard furniture made from wood or metal. You also need to check whether it is best away from a wall or in a corner. Sometimes, the latter can be beneficial as it allows sound to reflect. For others, they need space to get the sound waves out. How you plan on using your speakers will impact which type is the best option for you. Before buying, think about what you are going to use the speaker for, and plan accordingly. The ones above are best for music, particularly if you will be playing from a phone or tablet. Also think about how many you will need. If you want to fill the house with music, then one of the multi-room wireless options are best but beware you’re going to need a few of them. Or, you could buy a casting device to turn your current speakers into 21st Century Wireless devices. If you want the full surround sound experience, and will also be playing from your television, then aim for a complete set including speakers, subwoofer and additional sound-bar. Look at our home cinema page for some inspiration.